As the planet warms due to climate change and hot days become more common, the US electrical grid could be unable to meet peak energy needs by century's end, researchers warned Monday. 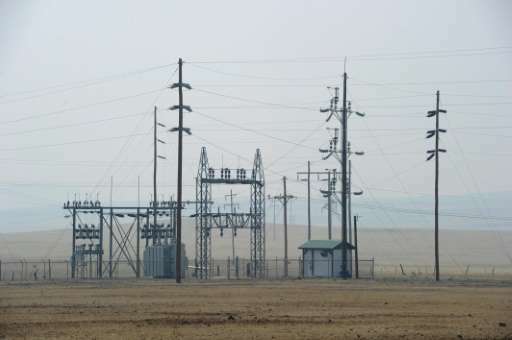 "As the electricity grid is built to endure maximum load, our findings have significant implications for the construction of costly peak generating capacity," said the study. But other areas, like the southern United States, "could experience an increased number of spikes in electricity use as hot days become more prevalent," said the study. These jumps in peak electricity demands "may require substantial investments by US electricity grids into peak electricity generating capacity." If the world continues to burn fossil fuels at the current rate, without any major effort to mitigate the damage caused by greenhouse gases, the United States' peak electrical needs could rise by as much as 18 percent and cost around $180 billion, said the report. Looking solely at average daily electricity use, researchers said that would rise by about 2.8 percent by century's end. "These estimates show that the existing papers focusing solely on consumption ... ignore(s) a large portion of the likely costs of climate change," said the report, led by scientists at the University of California, Berkeley; Stanford University, the University of Michigan and the University of British Columbia. Increasing the use of solar energy to meet demand "could smooth some of peak demand," added the study, cautioning however that sunny days don't always coincide with hot days. How does the power consumption of an AC compare with an EV. More Pathological BS from the AGW Cult and their Pathological "science". The problem with predictions like this is that it projects a future based upon the technology behind the consumption patterns remaining static. Yet if there is sufficient financial incentive to change, there will be change. A bigger concern (and this comes from engineers I know who work on transmission and distribution) is Electric vehicles. The grid was not designed with the capacity to charge electric vehicles. Sure the first few that get purchased will have a cheap ride. But as time goes on, someone is going to have to pay for all the upgrades that will be needed across the grid. Who will pay for that and how? That's the big question. Who will pay? The users or taxpayers will pay. When we put in our EV, the utility told me they would be monitoring the circuit for a while to see if it needed to be upgraded. That will become another capital cost of the system to them, and dealt with normally. But the change to EVs does not hurt the power company, they will gladly upgrade the local distribution system to sell you power. 180 billion doesn't seem all that steep a price. It's less than a third of the annual military budget. Stretched over 80 years I guess the US can stem this investment without giving up too much in terms of security. Particularly since most of that military budget seems to be geared to make sure that oil flow to the US remains constant. Any reduction of reliance on foreign oil could directly result in savings in the military sector which would easily pay for this investment within one year - let alone 80 years. It won't be consumption due to the weather that breaks the grid, it will be the unreliable and intermittent spikes & drops in production from thousands of wind turbines and solar facilities that does it in. Those are not facts, they are your supposition,but it is a good one. That may happen, but our penetration of PV and EV technology might be the saving of the grid. With the coming storage, the problems will be ameliorated. I suggest the market penetration of PV and EVs will save the grid, not threaten it. Want to see the opinion of the utilities themselves? Base the Grid on too many s---- windmills and solar panels and you BET it will overload! The coming storage has been coming for more than 30 years. There is still no competitive and enviro friendly storage technology on the books for at least another 15 (positive thinking here, could easily be another 30). Utilities only like wind and solar because they are paid (i.e. subsidised) to. Kill the subsidies and then let's talk about market penetration. It will be a short discussion because there won't be any. BTW - just as an aside, have you ever connected ten 1 kw generators together and then tried to run a house. Try it and let me know the results!! Oh, . . . tell me how you tie ten1 kW generators together to run a house. Tell us how the connections work - parallel or series? Do you think you are as intelligent or clever as real engineers? My house has 18 panels of 255W apiece, and are controlled by one inverter. No sweat. And battery storage is already being used in utility applications. You should really look this stuff up before blabbering: Facts Matter. There's numerous flow battery designs out there that work with cheap substances. The problem is not that there are no cheap technologies. The problem is that ther are too many. Utilities are waiting to see which one wins out for fear of investing in the wrong one. Tell me when it moves beyond advertising and into actual installations for the mass market. Flying cars have also been advertised, a few flown - none practical. Musk alone has stated that he will use the annual production of rare earth material just for his production run. Good luck getting more! gkam: one inverter in your house, for an installation in your house. Good for you. Glad to see you waste your money. Back to the point, you need infrastructure and a lot of it to tie together sources, particularly when they are not all in your backyard, varying distances from the load, and varying production. The grid is not built to support this and it will break. Hell, they are articles on physorg discussing this. Factsmatter, Well, since I am a former Senior Engineer for Pacific Gas & Electric, I may understand the operations of the grid better than you. And my PV plus inverter cost just over $12,000 and saved us $3000 last year alone. I can hardly wait until one of these massive lithium banks they want to build to store power has one of its cells short-circuit. The fire will make the Dresden post-bombing firestorms look tame. The article you provide is a trial. Again, many technologies are trialled, few go to mass market. Increasing the use of solar energy to meet demand "could smooth some of peak demand"
Interesting, Elon Musk justifies the spreading of his batteries exactly with opposite. "I can hardly wait until one of these massive lithium banks they want to build to store power has one of its cells short-circuit." We are well aware of the character of the Deniers. George kamburoff wastes our time correcting his lies. His PV and EV are lies. He was never a senior engr of anything anywhere. Facts matter enough to check them and these have been debunked as the spumings of a psychopath for self-gratification purposes.